Robert McCammon » Robert R. McCammon's "Beauty"
Welcome, Beauty was what the sign said. It was right up in front of the SeaHarp Hotel, where everybody in the world could see it. What I didn't find out until later was that the sign had said Welcome, Miss Greystone Bay Beauty, but the windstorm the night before had blown the rest of the letters to kingdom come. When my Momma and I saw that sign, she squeezed my hand and I felt like my heart was going to burst open. My Momma always called me Beauty, and now the SeaHarp was calling me Beauty too. Oh, that was a wonderful day! My Momma used to tell me the story of Cinderella. I could never get enough of it. And when we took the curve in that fancy, long black car they'd sent for us, and I saw the SeaHarp Hotel up on the hill in front of us, I knew how Cinderella felt. If you were to take a dream and put sugar frosting on it, you'd have the SeaHarp. All those windows, that green grass, the blue sky over us ... and that sign. It made my blood thrill, to think the SeaHarp knew my name. 'Course, my little sister Annie had to come along with us, and she was kicking a fuss because it was my day to get all the attention. But I didn't mind. Not much. I missed Daddy being there, but Mr. Teague wouldn't let him off from the mill, not even for a day like this. Momma says things about Mr. Teague that I wouldn't tell a soul. The driver pulled us on up to the front steps. Another man in a uniform came down and opened the door for us. We got out, and we went up to the porch and we didn't even have to carry our own bags. Then I stood at the open doors looking in at the SeaHarp like a frozen statue while Annie danced and raised Cain all around me. Momma told her to hush and not disgrace us, and the man in the uniform smiled and said, "It's our honor, Mrs. Guthrie," in a voice that let you know you'd gotten to where you were supposed to be. My Momma smiled, but her lips were tight; she was always ashamed of her teeth, the front one broken and all. Before we went in, I turned toward the Bay. It was full of sunshine. And then I just let my head turn along the crescent of the water, and way off in the distance I saw a smudge of smoke against the sky. It was coming up from a long brown building that hardly had any windows. "My Daddy's there," I told the man at the door, and I pointed. I saw my Momma flinch just a little bit, but the doorman smiled real nice. I won the contest, see. The Greystone Bay Beauty Contest, for young ladies sixteen to eighteen. The winner got a dozen roses, a hundred dollars and a weekend stay at the SeaHarp. And her picture in the paper too, of course. I'd just turned sixteen, on the second day of May. My Momma always had faith in me. She said I could sing up a storm, and my voice was okay I guess. She said, "Beauty, someday you're gonna go far. Gonna see and do things I never did. I wish I could go with you to those places." I said, "You can. Momma! You can always go with me!" She smiled, a little bit. "You're a beauty," she said, and she took my hands and held them. "Beauty outside, beauty inside. Me, I'm just a tired rag." "No!" I told her. "Don't you say that!" Because my Momma was a pretty woman, and there's nobody better say she wasn't. Isn't, I mean. The manager was waiting to meet us, in that big lobby bathed in light. He was a tall man, in a dark blue suit with pinstripes. He said how happy he was that the SeaHarp could host us for the weekend, but I hardly heard him. I was looking around that lobby, and trying to figure out how many of our house could fit in it. Maybe ten. We only had four rooms; they called where we lived a "shotgun shack," and the walls were gray. Not in the SeaHarp. The walls were white, like clouds. I'd never seen so many chairs, sofas and tables outside of a furniture store, and there were crystal vases full of fresh-cut flowers. I've always loved flowers. I used to pick daffodils in the Spring, where they grew along the creekbed outside our back door. "Hello," the manager said to me, and I said hello back. "Someone's wearing some nice perfume." "That's violets," Momma said. "She always wears the scent of violets, because that's a right smell for a beauty like her." "Yes," the manager agreed, "it certainly is." And then he snapped his fingers and you would've thought the carpet has sprouted bellboys like mushrooms. It's strange, how you notice things. Like the pink dress my Momma and Daddy had bought for me to wear. It looked fine in the gray light of our house, but at the SeaHarp ... it looked like the pink was old and faded. It looked like something that had been on a hanger for a long, long time. And the sheets of my bed in that room were so cool and crisp; they embraced you. They didn't want you to leave them. The windows were all so clean, and the sun was so bright, and you had hot water whenever you wanted it. Oh, that was a Cinderella dream come true. Momma said Daddy was going to come visit the SeaHarp when he got off work, even if it was at nine o'clock at night. She said Daddy was so proud of me, just like she was. All Annie did, though, was prance around and make a mighty fool of herself. Momma said she was going to lie down and have a rest, and for me to watch Annie and keep her out of mischief. We went off together, through the white hallways, and we found the stairs. Sometimes I get tired real easy. Sometimes day seems like night, and night seems like a long day when clocks won't move. I get tired, and I can't think right. I leave my room, where the crisp cool sheets of that bed are always laid open like a blue wound, and I go to the elevator. I know the elevator man's name: Clancy. He's a black man with gray hair, and he knows me too. He brings the elevator to where I wait, and when he cranks the doors open I step in smooth as pink silk. "Evenin', Beauty," Clancy says. I say hello to Mr. Clancy. "Mighty quiet in the SeaHarp tonight," he says—this is what he always says. Mr. Clancy only works during the quiet hours. He cranks the doors shut, pulls a lever and the old elevator begins its descent. I listen to the cables and gears turning above our heads. A gear needs oiling; it squeaks too loudly. "What time is it?" I ask Mr. Clancy. "Gloria's sister June is gonna have a baby," he answers. Oh, he can be a mean man! Sometimes he acts as if you have no voice at all! "Got the names all picked out. Third baby for her, shouldn't be no big thing." "Is it springtime, Mr. Clancy?" I ask. "At least tell me that." "Smithie got a raise. Seems like I oughta get a raise. You know, that Smithie's always complainin' 'bout one thing or another." I want to scream, but that would be beneath me. To tell the truth, I like hearing Mr. Clancy talk to me. I like the sound of his voice, and the noise of the elevator. I don't care for the stairs. The elevator arrives at the lobby. The doors open, and I see the lamps glowing and the beautiful walls and furniture; all there, all just the same as the first day. "You sure smell nice tonight. Beauty," Mr. Clancy says as I leave—he always says this—and I turn back and say thank you to his blind-eyed face. Then Mr. Clancy sits on his stool and rests awhile, waiting for me to return. I roam the lobby, between the walls of clouds. There are new, fresh-cut flowers in the crystal vases. I decide it must be springtime, after all. 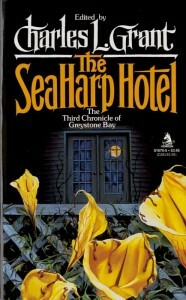 At the SeaHarp, it's always springtime. This is my Cinderella dream. I can sing here, and dance across a carpet the color of sun on the Bay. Once I saw a young man walking here; he was a handsome young man, older than me. Maybe he was twenty. I walked beside him, but he had a newspaper under his arm and no time for beauty. I drift amid the vases, and some of the flowers rustle as I pass. Sometimes I hear other voices here: fragile voices, drifting in and out. Daddy used to have an old radio he kept in the front room, and Annie and I listened to it. That's what those voices are like: from faraway places, places that aren't nearly so beautiful as this. I don't like the attic. They don't keep it clean enough, and the voices up there want you to do naughty things. Once I was here, dancing and singing, and I saw the manager. The very same man. I recognized him by his walk, and the way he snapped his fingers at the people behind the front desk. They jumped like whipped dogs. I came up behind him and snapped my fingers at his ear, and he turned around real quick and for a second he looked right straight into my eyes. Oh, no, I thought. Oh, no. This couldn't be the same man. I was wrong. This was an old man, with white hair and a wrinkled face. Oh, the man I was thinking about was a lot younger than this. But he must've smelled my violets, because he made a gasping sound and stepped back against the counter and his eyes were as big as silver dollars. "Talk to me," I said. "Somebody talk to me." But the old man just gasped, and I went on. I get tired, real easy. Mr. Clancy takes me in the elevator, back up to the third floor. "Goodnight, Beauty," he says, and I wish him goodnight too. Momma always said being polite was a sign of good blood. The door to Room 301 is open. It's always open. I wouldn't have it any other way, because if anyone wants to come in and talk to me, I want them to know they're welcome. I go inside—and there's a woman sitting in a chair, a lamp with a blue shade burning next to her. She looks up as soon as I come in, and her eyes widen. She shakes a little bit, as if she's about to get up and run for the door. But she settles down and sticks, and I drift past her toward the bed with blue sheets. "You're there, aren't you?" the woman asks. Her voice is strained, but ... I know that voice, from somewhere. "You're there," she says, positive now. "It's Ann, Beauty. It's your sister Ann." "I know who my sister is!" I say, turning toward the woman. "But you're not her!" This is an old woman sitting in my chair; an old woman with gray in her hair and deep lines on her face. "My sister's a little girl!" "I ... don't know if you can understand this or not." The old woman who's pretending to be my sister stands up, and she grips her hands in front of her as if she's afraid they're going to fly away like wrinkled birds. "I wanted you to know ... that Momma died tonight. At the hospital. The cancer got her." "Liar!" I shout. "You dirty old liar! Get out of my room!" "Momma asked me to come tell you," the crazy old woman goes on. "I was right there when she died. Can you understand what I'm saying?" "Jesus, I must be a damn fool." The woman shakes her head. "I'm talking to the walls. I'm in a damn hotel room, talking to the walls." "It's better she passed on," the woman says. Why did such a crazy old fool think I'd believe she was Annie? "Momma had some pain. It's better this way." She looks at her hands, and I can see them too, in the lamplight. The fingernails are broken, and her hands are rough and cracked. They're the hands of my Momma. "I ... came up the stairs, Beauty," she says. "I was going to take the elevator, but ..." She shrugs. "I needed to walk up the stairs." Then she lifts her head, and I watch her look all around the room as if she's searching for a ghost. "Beauty," she says, in a very quiet voice, "I want to ask you something. It's been ... tearing at me, for such a long time. Beauty, please tell me ... I didn't make you fall down those stairs, did I?" She's not my sister! My sister's a little girl! "YOU GET OUT!" I shout at her. . .
"Please tell me. It's been killing me, all these years. I didn't make you fall ... did I?" She waits. Annie, what happened to us? What happened, in an instant when balance failed? What time is it, and where is our Momma? "Please ... please," Annie says, and she lowers her head and begins to cry. "No," I tell her. "Annie? You didn't make me fall. Okay?" Annie keeps crying. She always did like attention. "I'm all right now," I say. "See?" She sobs, and runs a hand over her eyes. I remember something, now: here, in my room, Momma sitting on the bed and crying as she told me Daddy had died. An accident at the mill, she said. An accident ... just like yours was an accident. "Annie!" I say. "I'm all right! Stop crying!" "I just wanted to tell you about Momma," Annie says. She blows her nose on a tissue and wads it up. An old stranger, she moves toward the door. Then she stops, on the threshold. "Beauty? I don't know why you stayed here. Maybe Momma did, but I didn't. Maybe you're here and maybe you're not, but ... if you can, could you go be with Momma? I mean ... it seems like it's time for you to leave here, Beauty. It's time for you to go on." And then my sister goes through the door, and I follow her to the staircase. She descends, treading carefully, and I watch her out of sight. "Annie?" I call down after her. "I love you!" Momma? Are you here, Momma? Have you come to be with your Beauty? No, Wherever Momma is, she's not at the SeaHarp. She's gone to a place I should have gone to first. She's already seen things I never have. But we can be together again! Can't we? If I want to be with her, I have to leave the Cinderella dream. I don't think I'm ready for that yet. I'm afraid. I love the springtime, and I'm so afraid of winter. But I have my answer now. I know what time it is. Annie told me: it's time to leave here. It's time to go on. Maybe I will. Maybe. But if you were to take a dream and put sugar frosting on it, you'd have the SeaHarp. Do all dreams have to end at midnight? Do they? My head hurts. I get tired real easy. I want to rest in the blue sheets, and I want to hear the Bay crash against the rocks. I want to dream of pink dresses, a dozen roses, and a sign that said Welcome, Beauty. Maybe my Momma will find me in that dream. Maybe she's waiting for me there, and if I hurry we can go together. But the SeaHarp holds me. It's so full of light and beauty, so full of dreams. Can't I stay here, just a little while longer? I need to rest. Mr. Clancy will be waiting, at the elevator. He is the master of his little square of the SeaHarp, just as I am the mistress of mine. Tomorrow is the first day of spring. I am sixteen years old, there will be fresh-cut flowers in the crystal vases, and all the world will be beautiful. Copyright © 1990 by Robert R. McCammon. All rights reserved. 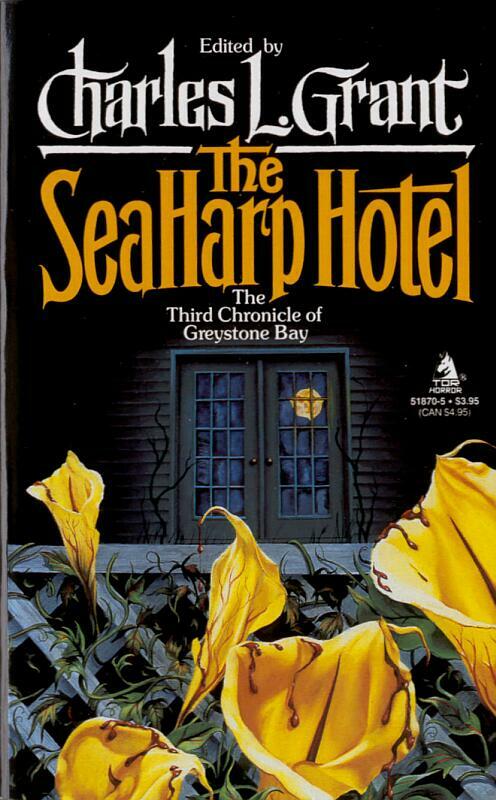 This story originally appeared in the anthology The SeaHarp Hotel: The Third Chronicle of Greystone Bay, edited by Charles L. Grant and published in 1990. Reprinted with permission of the author.